Well, they did it. You can debate till the “holy cows” come home whether Harry Caray’s Italian Steakhouse fully captured the “live it up, the meter’s running” spirit of its dearly departed namesake. Or whether Iron Mike Ditka’s various restaurants nailed that “Grabowski-chic” vibe they were going for. 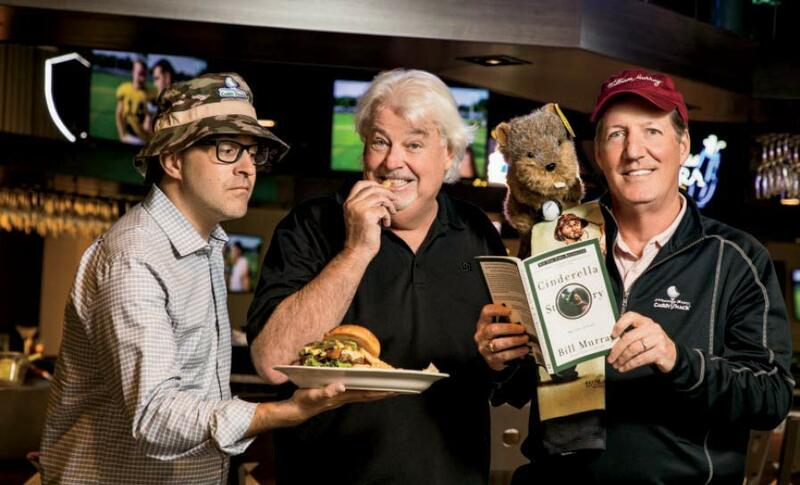 But this much is undeniable, the new Caddyshack restaurant in Rosemont is an 8,600-square-foot shrine to that slow-burn sarcasm of Bill Murray and his merry band of brothers from Wilmette. There are as many Bill Murray “Easter eggs” embedded in this place as sly references to the 1980s in Steven Spielberg’s Ready Player One. Some are easy to spot, like the Caddyshack quotes on the rafters and the museum-worthy collection of movie posters. Some are more subtle: That green-blue tartan sheathing the booths is the official Murray family plaid. And some are downright hilarious, including the restaurant’s gift shop, which hawks religious candles depicting Bill Murray in various saintly poses. Despite a rather anemic-looking façade—the space was once a private banquet hall space for the connected Crowne Plaza Hotel—the experience inside embodies that deadpan Murray sense of humor. And the staff—whether it’s former General Manager Mike Avella, a Gibsons restaurant group alum, or the hands-on mastermind of the restaurant, Bill sibling Andy Murray—are always dropping by tables to spin yarns while their excellent servers offer recommendations and generate smiles. The Murrays have said they wanted the service to be like partnering with a PGA-tour caddy. At this point, they’re shooting birdies. In terms of the food, no one is aiming for an uppity fine-dining experience. It’s the opposite. Consider this question: What would you most like to eat and drink while you’re watching the Bears, Cubs, Blackhawks, and Bulls? 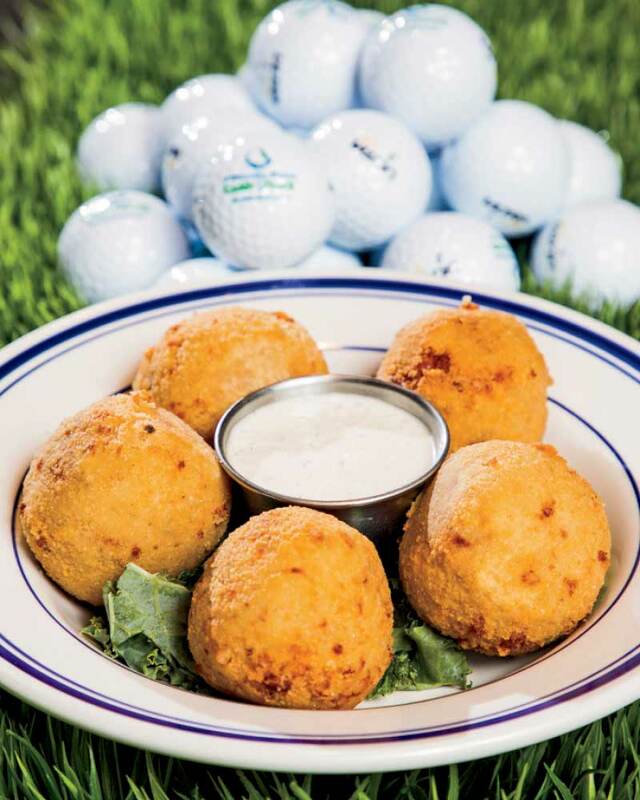 The Murrays answers include plenty of fun bar bits, like the house’s signature crispy potato golf balls (i.e. the common man’s croquettes), bundles of garlic mashed potatoes studded with cheddar cheese and bacon served with horseradish cream dip. And on it goes. You can imagine the Murray brood, in their younger years, sitting around the family table in Wilmette hatching wild ideas for what they wanted for dinner. And then waiting, waiting, waiting until they could open up their own place and foist it upon the public, which they’ve done here. The house Brussels sprouts come lacquered in a spicy buffalo ranch sauce and are then dipped like chicken wings in blue cheese or ranch dressing. There are flatbread pizzas, oblong and crispy, which seem to be inspired by everything from a three-layer taco salad (bean and cheese sauce with nacho accouterments) to a kitchen-sink pizza (sausage, pepperoni, peppers, mushroom, and onions). The value, in terms of the size to price ratio, is outstanding, especially when it comes to the salads, which come out in bowls big enough to make the old Don Roth Blackhawk blush. 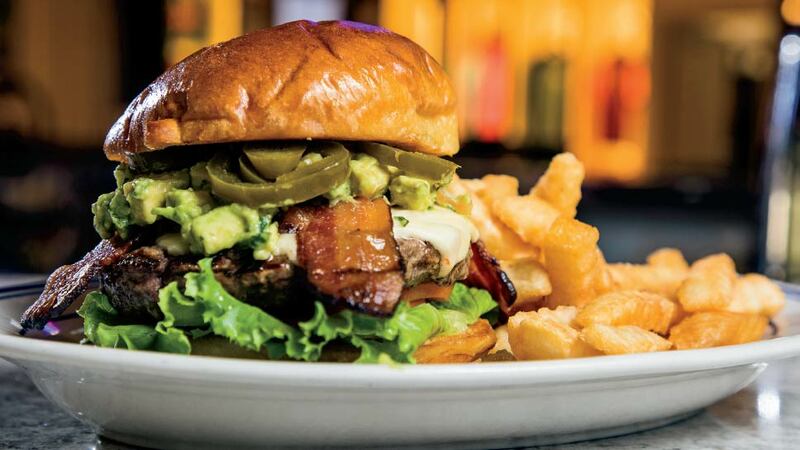 All the burgers are half-pound monsters dressed up to the nines, including a stellar bacon-guacamole burger with pepper-jack cheese and jalapenos. Bill Murray, in his typical laconic style, has made it known that he loves his kitchen’s bacon, which may explain why it’s gleefully sprinkled through the menu. It’s a nice addition to the best dish on the menu—the house prime rib—which comes with a bacon-spiked sprout hash and a big divot of mashed potatoes. Chef Peter McGarrity, formerly of Harry Caray’s, knows how to lock in those juices and produce melt-in-your mouth tenderloin with a rosy pink center. When Caddyshack opened in Rosemont last April, Andy Murray sent around free cocktails because he was so darn proud of the drinks. His new obessions is dessert—so much so that it’s now become something of a running joke. It’s pure Candyland. The house strawberry shortcake is more like a giant shortbread cookie smothered with whip cream and strawberry ice cream. There is a brownie, roughly the size of home plate, that’s covered with ice cream as well as mason jars filled with a smooth chocolate mouse. The only remaining question, as we waddled out of the restaurant, was what took Caddyshack so long to come home, seeing the original Caddyshack opened in Florida 17 years ago. Murray Bros. Caddyshack is located at 9546 Balmoral Avenue in Rosemont, 847-443-3673, mbcshack.com.